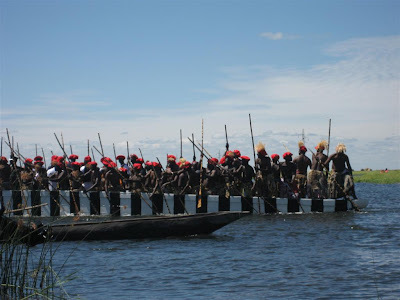 "The ancient war drums sound, the enormous boat charges forward by the power of 100 royal paddlers in leopard skins and lion manes, smoke bellows to tell the Losi people that their Paramount Chief (Litunga) is alive and strong, and it is time to follow him to the highlands." 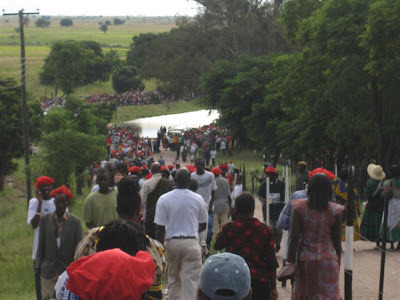 This is not a historical quotation from Britannica, this is what I witnessed today, March 31st 2007 in the Western Province of Zambia. 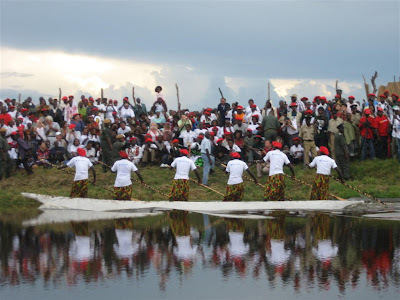 The ceremony is called Kuomboka and it signals the Losi people of the Zambezi floodplain to make their annual retreat to the highlands, safe from the floods, as they have done for over 300 years. Seeing this firsthand was electrifying and humbling. Electrifying to stand among thousands of Losi people, feeling the ancient drums beat and watching the huge boat carry their Paramount Chief and humbling to recognize the strength, organization and history of this powerful tribe. 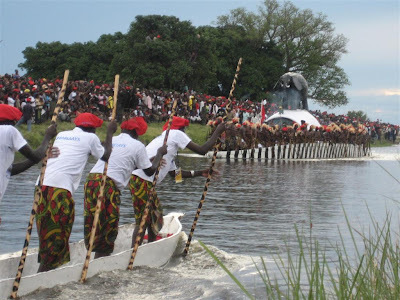 Kuomboka literally means "to move out of water" and that is the essence of the event. 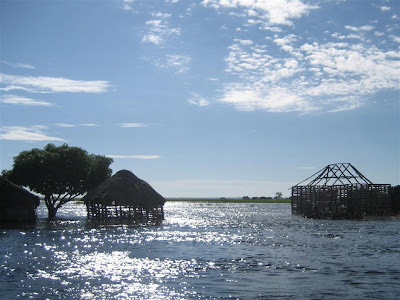 The date is set by the Litunga (The Paramount Chief) who considers the level of floods, the availability of food and the phase of the moon. It is only announced a few weeks beforehand. You may wonder why the Losi chose to settle in a floodplain? The reason is actually quite simple. Most of Western Province is Kalahari dessert and the sand is hot, dry and infertile. However, contrasting this dessert sand, is an enormous floodplain of black soil that is replenished yearly as the Zambezi river bursts and washes in water, nutrients and fish. This is a good place to farm. The problem is that when the floods come, the floods come with fury. This year I saw water rise 15 feet and a massive flood plain fill-up in just a few days time. For families, these floods bring problems: mosquitoes, disease, drowning, crops flooding and general discomfort. The response then is to make a break for the sunshine-to high grounds-to wait out the worst of the waters. 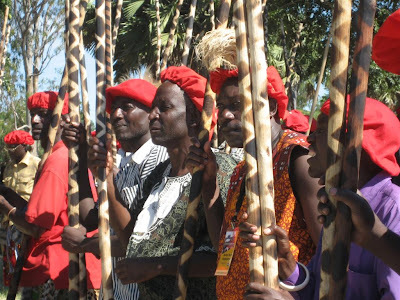 The journey itself is called the Kuomboka Ceremony, it all begins at Lialui, the Lintunga's dry season palace which situated in the middle of the Zambezi Floodplain. Around the palace, crowds gather to catch a glimpse as the royal subjects who are carefully porting the Lintunga's possessions to the royal boat. 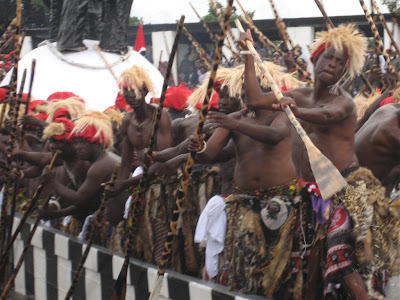 Following them, is the Litunga himself who will be accompanied by his Prime Minister and other local area chiefs (Indunas). He walks proudly and is greeted by this royal paddlers, who know it be a great honour to paddle for Litunga. 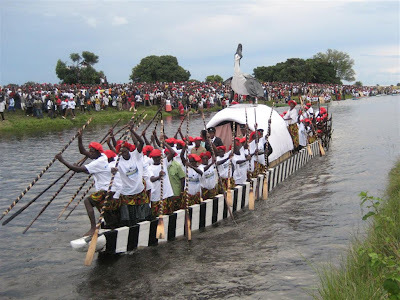 The Litunga's boat bears the legendary name of Nalikwanda. 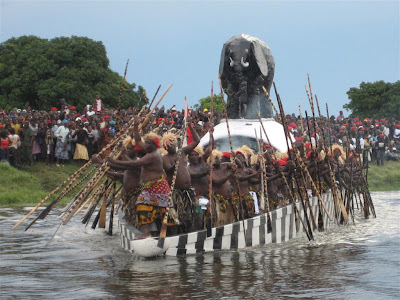 It is a barge of magnificent size, able to carry the chief, his possessions, his attendants, his musicians, his 100 paddlers and is capped with a statue of an elephant, the Losi symbol of power. The Litunga's goods are loaded and he takes his place in the shade under the elephant while the royal drums and xylophone play. The quality and sound of the instruments are mind blowing and mesmerizing. Two white scout canoes are sent first to check the depth of the water and for the presence of enemies. These five person dugout canoes glide with speed and precision. 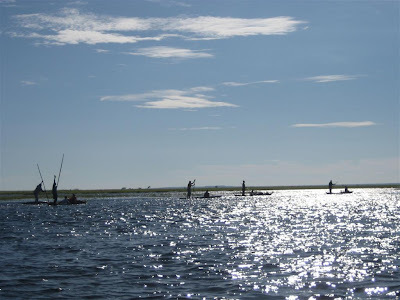 Once signaled by the scout boats, the coordinated paddlers heave mightily and release the heavy boat from shore to begin the journey to the highland. 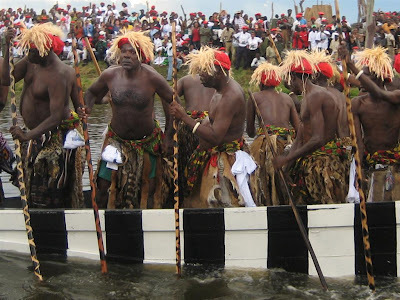 The Lintunga's royal boat is followed by one for his wife, the Queen, and one for the Prime Minister. Hundreds have come to watch the Lintunga set off. 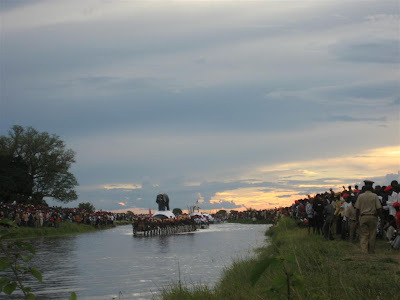 Now under the hot sun, the boat moves through hand dug canals, rivers and standing water. It will take 6-8 hours to reach the final destination of Limulunga, the highland palace. It is said that the journey is grueling and in old days fatigued paddlers were thrown out of the boat to the crocodiles. The drums continue to beat, coordinating and energizing the paddlers. 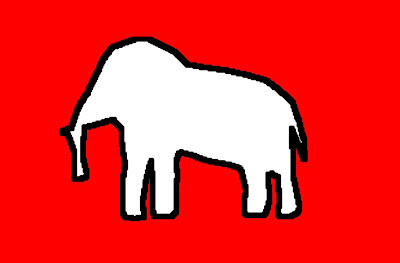 Finally, on the horizon a large black elephant is seen moving slowly in the distance, then the ancient drums (one thought to be over 150 years old) are heard playing the familiar beat only played for this ceremony, the crowd erupts upon first sight and sound! The scout canoes sprint down the canal to make sure all is safe for the Litunga. They move at impressive speeds, obviously energized by the cheering crowd. 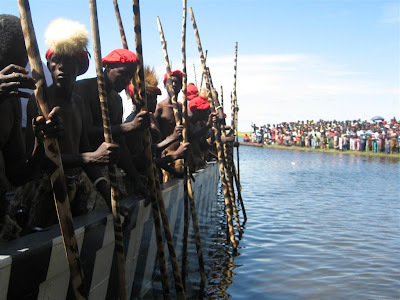 They continue to do do laps as the Litunga's boat approaches. Now, the Lintunga does not just sail in and land. His boat fiercely charges the bank and then retreats three times, each time playing a different war song to flush out any enemies planning to ambush. On the third time the giant vessel plows into the bank. The boat for the Queen (with the crane on top) and that of the Prime Minister follow behind. 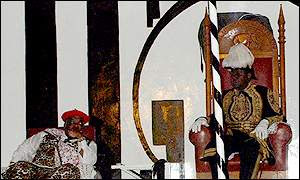 Remember, when the king boarded his boat he was dressed in traditional garb, but as he emerges at his destination he steps out wearing a finely polished British commissioner's uniform given to him from the British Royal Family during colonial times. 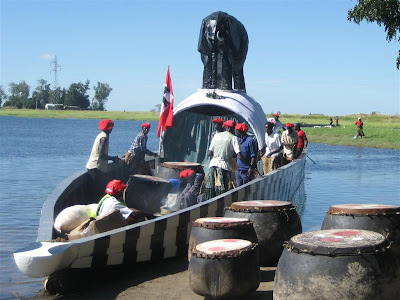 Among the waiters is Levi Mwanawasa, the reigning President of Zambia who rises and greets the Lintunga at the foot of his boat. They then walk together up the long road to the palace with a rambunctious following. 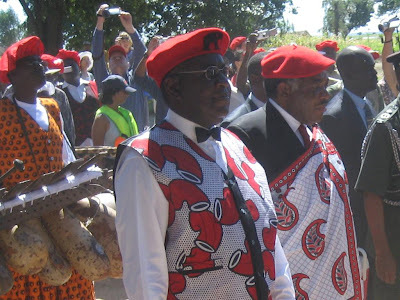 Here the Litunga addresses the crowd, before entering his palace for a night of feasting and dancing. The following days are a celebration for all in the area! For me, being able to witness Kuomboka was electrifying and humbling. This ceremony with it's very practical roots holds great symbolism and importance for this tribe and I'm happy to see it flourishing today. - Chad a.k.a. 'Nalishebo' as I'm now called. This is my fave post so far! Love the pictures. Nicely done. Andrew and I just booked our tix and we're actually going to be coming a little earlier than expected. We're leaving Canada May 28th. Hope you're not going to be too busy around then. great post! I loved the pictures. seems like a really amazing ceremony, funny how you can see white tourists in some photos though. did you find there were lots of Westerners come to watch the events? keep posting, I'm waiting for more! Those pictures brought back a lot of fun memories from last year. I was particularly happy to see that there was still lots of people up in the trees trying to get a better view. Eli, it was raining people as branches broke! You would have loved it. Great shots Chad. Thanks for having the patience to upload all of these photos. I love the Barclay's sponsorship! What an awesome festival and amazing pictures. Thanks for sharing the story and keep the posts coming. i am ashamed to admit that this is the first time i have visited your blog. i was unaware that it existed. i am very impressed!! Lou is getting quite excited, i will miss her and you better take care of her for me. (no lion encounters!) good thing you have your personal gym because i wouldnt want her to come back too skinny! keep it up you are an amazing individual!! Just saw your article in a CCPE/Engineers Canada supplement in the G&M. Great work! Hope all is well in Zambia. Lovely blog, Chad! I was hoping to attend Kuomboka but wasn't able to time it right, so I love seeing your photos. As a fellow blogger here in Zambia [I'm in Kafue Natl Park], it's nice to "connect" with others in this way . 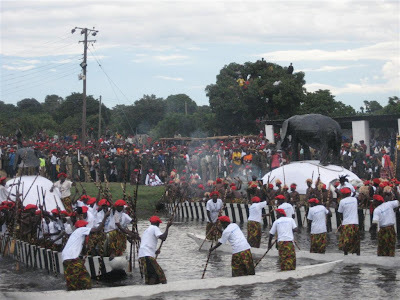 . .
You have very good photos of Kuomboka ceremony. 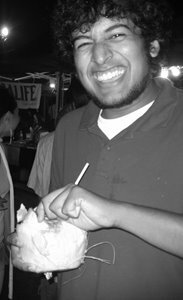 May I kindly use them for a regional publication. I will definitely credit you as the source. Hey Chad, I represnet a film company and would really like to communicate with you over your experience at Kuomboko, my personal email address is dancalders@yahoo.co.uk. If you could send me an email it would be great to hear more about this fantastic ceremony from you. Dan. 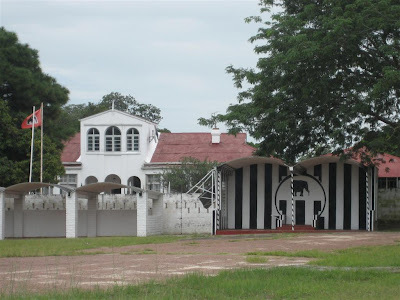 Hi Chad, just stumbled upon your blog- I'm volunteering in Zambia as a teacher, in Lusaka, and desperately trying to get to the Kuomboka this year- Can't find info anywhere tho as to when it will be! Do you happen to know? As a fellow Canadian it makes me proud to see you in Zambia making a difference. 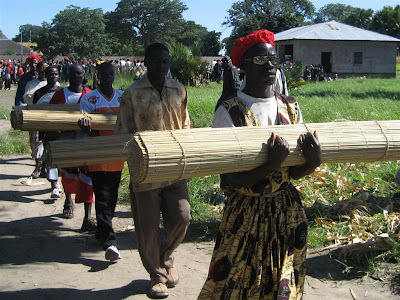 I was drawn to your blog when our sponsor child through World Vision Canada, mentioned in a recent letter about the Kuomboka Ceremony. You brought it to life for me and my family and I wanted to say thanks for that. I enjoyed your article on Kuomboka. By the way, desert is spelled with one s.